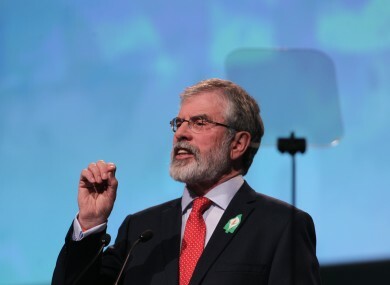 GERRY ADAMS told the delegates at this year’s Sinn Fein’s Ard Fheis that the Proclamation was not meant to be read every 100 years, it was meant to be lived. He said that when in government, Sinn Féin will deliver this change. It is an absolute disgrace that in this centenary year the relatives of the 1916 leaders were forced to take the government to the High Court to save the National Monument at Moore Street.This Fine Gael and Labour government wanted to demolish it. They backed the property developer. They wanted to demolish the national monument. He said the families of those that died, who were present in the Covention Centre tonight, fought to protect “our national heritage”. We are not Fine Gael or Labour. We are proud of the men and women of 1916. We are not Fianna Fáil. We are equally proud of the men and women of the H Blocks and Armagh and of the 1981 hunger strikers and of the patriot dead from our time. We remember them here tonight. Adams also followed Mary Lou McDonald’s earlier speech, launching an attack on Fianna Fail. In nasty little soundbites, which would make the DUP blush, the Fianna Fáil leader in particular, proclaimed that this party, that the people in this Convention Centre, and more importantly those citizens who vote for Sinn Féin, are not fit for government. Adams also said he would not put Enda Kenny back into government. But putting Fine Gael back into power is exactly what he is doing. That’s not in the national interest. He said Fianna Fáil voters did not vote to give Fine Gael another term, stating that Micheál Martin would prefer to put Fine Gael back in government as part of his effort to counter the growth of Sinn Féin. So, I have a message for Teachta Martin. You promised in your manifesto to abolish Irish Water and to scrap water charges.Water charges must go. Irish water must go. In closing, speaking to the full to capacity auditorium, he recalled the words of Luke Kelly. To those brave men and women who fought and died that Róisín live again with pride? Email “Gerry Adams: 'We are not Fine Gael or Labour. We are proud of the men and women of 1916'”. Feedback on “Gerry Adams: 'We are not Fine Gael or Labour. We are proud of the men and women of 1916'”.